As both the Li River in Guilin of China and Halong Bay in Vietnam are famous for karst scenery, a few customers asked me the same question: "Is it worth doing a Halong Bay cruise after having done a Li River cruise in Guilin?" My answer is simply "yes" because they offer a totally different experience. Hopefully, the following will give you a better idea of what are the differences between the two types of cruises. Although both Guilin and Halong Bay are famous for karst formation, they're different in size and environment. In Guilin, you will see karst formations along the Li River on land while in Halong Bay you will see karst peaks rising from the sea. The Li River is much smaller while the Halong Bay looks more spectacular. 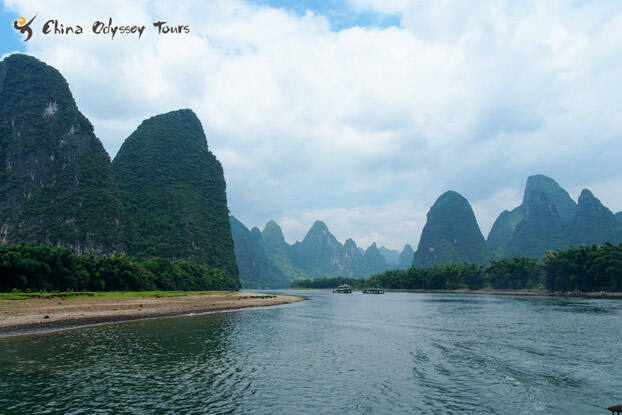 A typical Li River cruise lasts for some 4 hours. The cruise starts at around 9:30 am (though you need to depart from Guilin to Zhujiang Pier or Mopanshan Pier at around 8:00 am) and arrived at Yangshuo at around 1:30 pm or 2:00 pm. And because it’s only a short tour, the boats there is only seats and no cabins on boats.  Normally, a boxed or buffet lunch is provided and covered in the tour package. The majority of people would choose an overnight Halong Bay cruise, which offers more activities to do and more time to savor the beauty of Halong Bay. There are cabins for overnight cruises. Full broad is included. 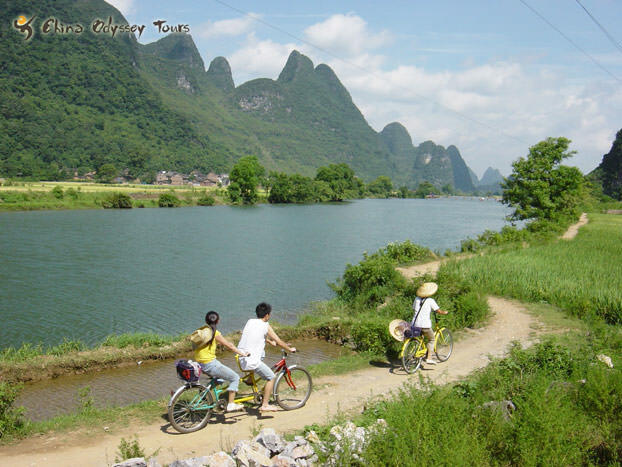 A Li River cruise is more about admiring the picturesque scenery and taking stunning photographs. The Li River shows different beauty at each season. The beautiful scenery never disappoints visitors. It gives you surprises at each bend, from water buffalo patrolling the fields, peasants working in rice paddies, to school kids and fisherman float by on bamboo rafts. You’re close to the countryside and nature. The only downside is the cruises do not stop and offer no activities. 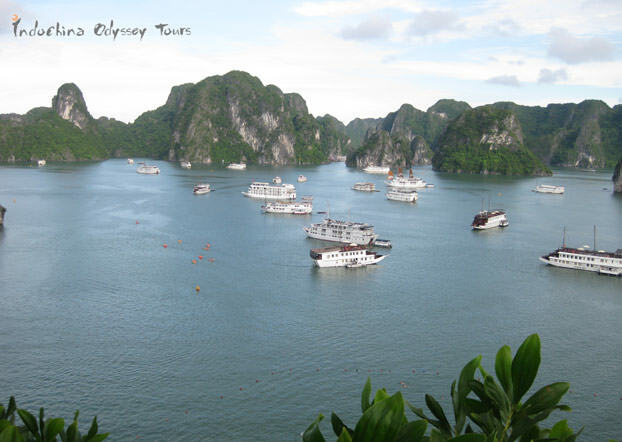 Compared with the Li River cruise, a Halong Bay cruise offers a richer experience. Classic wooden vessels offer breathtaking views of unspoiled wilderness and gourmet meals that reflect the flavors of the Halong Bay. The boats ply the waters slowly and take scenic, circuitous routes. On the boats, you can take a cooking class, practice morning Tai Chi, or do a massage. Along the way, the ships dock in secluded harbors where you can kayak, go caving, visit fishing villages, go swimming, etc. There are more chances to get close to nature. 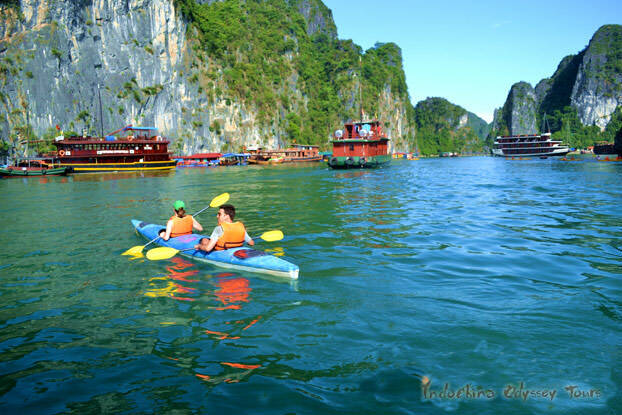 Overall, the Halong Bay cruise is more about leisure and experience. Two or three days’ Halong Bay cruise will take away all your worries. The price of Li River cruises ranges from RMB 350 (USD56) for an ordinary cruise (no English speaking guide and only box lunch) to RMB 450 (USD72) for a luxury ride (with English speaking guide and better buffet lunch, and more comfortable seats). The price of Halong Bay cruise (most with English-speaking guide onboard, including meals and accommodation) varies from boat to boat, ranging from just dozens of dollars per person to USD200 and up per person, depending on your choice of duration and boats. It can be cheaper or more expensive than a Li River cruise. No one can actually make a fair comparison between the two types of cruises, because they offer totally different experiences. I’ve done both and enjoyed both. If there are any questions you'd like to ask me about Halong Bay cruise or Li River cruise, feel free to contact me via . I'll be glad to answer all your questions.